Many gene variants are linked to chronic pain and analgesic response, but more often than not, their function is unclear. A study published online March 25 in Nature Medicine bucks the trend, with researchers reporting that variants in the gene for the ligand-gated cation channel P2X7 affect chronic pain by controlling the ability of the receptor to form large, nonselective pores in cell membranes. Jeffrey Mogil at McGill University, Montreal, Canada; Michael Salter at the Hospital for Sick Children, Toronto, Canada; and collaborators discovered that pore-disabling P2X7 variants are associated with lower inflammatory or neuropathic pain in mice and people. The findings indicate that P2X7 genotype contributes to pain sensitivity, and also suggest precisely how to target the protein for therapy. The results “make a very specific prediction,” said Mogil. “If you want to make a drug based on P2X7…you don’t want to abolish the whole activity of the receptor. All you need to abolish is the pore activity.” The group confirmed this hypothesis in mice by using a peptide that specifically blocked P2X7-mediated pore formation to alleviate pain. Like its relatives in the P2X purinoreceptor family, P2X7 is an ATP-gated, nonselective cation channel. But the protein can also induce larger pores that allow molecules of up to 900 Daltons to pass through cell membranes. The two functions appear distinct: P2X7 possesses ion channel activity on its own, but the formation of the large pore requires another protein, pannexin 1 (Pelegrin and Surprenant, 2006; Locovei et al., 2007). P2X7 is known to mediate pain, but where it acts, and what key downstream effects it produces, are not well understood. The protein is located primarily in immune cells in both central and peripheral tissues, and triggers release of pro-inflammatory cytokines. In mice, deleting the gene that encodes P2X7 (P2rx7) prevents hypersensitivity from inflammation or nerve injury (Chessell et al., 2005; Clark et al., 2010; Hansen et al., 2011), and pharmacological blockade also lessens pain. P2X7 is an object of numerous drug development efforts for arthritis and other painful conditions, and some antagonists have entered clinical testing (for reviews, see Gum et al., 2011; Chessell et al., 2011; Guile et al., 2009). Existing drug development, however, has not specifically targeted pore formation versus cation channel activity. In the new work, co-first author Robert Sorge and colleagues in the Mogil lab first found that different strains of mice displayed varying levels of touch hypersensitivity (allodynia) following spared nerve injury (SNI), a model of neuropathic pain. The group identified genomic regions where sequence variation correlated with pain, and an area in P2rx7 topped the list. Within the region lay one polymorphism that produces an amino acid change in the protein and affects P2X7’s ability to form pores. Among 18 strains tested, those exhibiting high allodynia carried the pore-forming allele, while low-allodynia strains carried an allele that impairs pore formation. The change in P2X7 appeared to be involved uniquely in pathological pain, since it had no effect on mechanical sensitivity in healthy animals. To pinpoint the crucial P2X7 functions, co-first author Tuan Trang and associates in the Salter lab examined P2X7-containing cells from mice with high- and low-pain alleles. They found that a P2X7 agonist increased intracellular Ca2+ concentrations in macrophages from both strains, indicating that the P2X7 variants did not affect the receptor’s ion channel activity. However, in macrophages loaded with a high-molecular-weight dye, the agonist triggered dye release only from cells with the high-pain allele, and the leakage could be blocked using inhibitors of either P2X7 or pannexin 1. 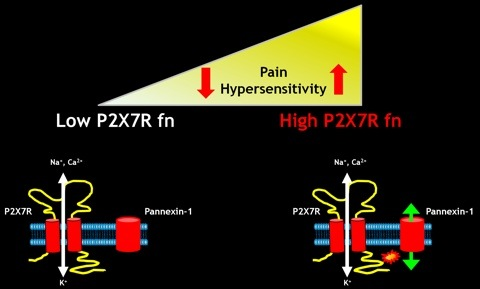 Those results signaled that P2X7 activation opens large membrane pores in pain-prone mice, whereas in pain-protected animals, pore formation is blocked. Also in mice, intravenous administration of a P2X7-derived peptide that specifically blocked formation of the large pore muted allodynia. The treatment counteracted pain from either SNI or complete Freund’s adjuvant (CFA)-induced inflammation, and worked only in animals with a P2X7 allele capable of forming pores. Collaborators on the study discovered that similar genetic variations in human P2RX7 were related to the severity of chronic pain. Among 354 women with post-mastectomy pain, three single-nucleotide polymorphisms (SNPs) in P2RX7 were associated with pain intensity. Women with an allele known to heighten pore function tended to report more intense pain, whereas those with a low-functioning allele reported lower pain. In a separate cohort of 743 patients with osteoarthritis, one of the pore-promoting SNPs was associated with the risk of clinically relevant pain. The results in clinical cohorts “will likely restimulate interest in P2X7 as a target for treatment of pain,” said Iain Chessell, MedImmune, Cambridge, UK. Chessell has studied P2X7 extensively but was not involved in the new study. “I think the interest will be to look at the molecular profiles of the chemical entities that were previously generated and to try to match those to the mechanism described in this paper,” he told PRF. Disrupting P2X7-pannexin coupling to preferentially preclude formation of large pores might offer a focused therapeutic approach with the potential for fewer side effects compared to indiscriminate P2X7 inhibition. Moreover, Salter said, individuals likely to benefit from P2X7-targeted therapies could be identified prospectively by P2RX7 genotyping. Top image: Detail of the human P2RX7 gene showing polymorphisms (Sorge et al., 2012). Image credit: Adapted by permission from Macmillan Publishers Ltd: Nature, advance online publication, 25 March 2012 (doi: 10.1038/nm.2710). Sorge RE, Trang T, Dorfman R, Smith SB, Beggs S, Ritchie J, Austin J-S, Zaykin DV, Meulen H V, Costigan M, Herbert TA, Yarkoni-Abitbul M, Tichauer D, Livneh J, Gershon E, Zheng M, Tan K, John SL, Slade GD, Jordan J, et al. Nat Med. 2012 Apr; 18(4):595-9. Epub 2012 Mar 25. This elegant study provides evidence for P2X7 receptor mutations that result in a loss of the ability to form pores while leaving channel function unaltered. As a result of such mutations, mice do not develop neuropathic and inflammatory allodynia, and patients with impaired P2X7 pore formation develop less severe chronic pain after surgery, or as a result of osteoarthritis. This is exciting news in pain research and for the development of new analgesics, as the findings can help us interpret unsuccessful trials in chronic pain with P2X7 receptor antagonists. Furthermore, with the information provided by this study, it would be possible to optimize the recruitment of patients and perhaps reduce variable outcomes in trials. Preclinical scientists are provided with a new tool, the TAT-P451 peptide, for identifying and validating the P2X7 receptor’s role in chronic pain states, as well as precious information about the strain of mice most susceptible to developing pain. In the near future, potentially it would be interesting to evaluate whether an intrathecal injection of TAT-P451 in the spinal cord of neuropathic animals attenuates allodynia by targeting central P2X7 receptors. Indeed, in this study, TAT-P451 peptide, unless actively transported, is likely to have remained outside the blood-brain barrier, thereby targeting peripheral receptors.